The Doon Valley Public School, Deoband, is a co-educational English medium public school, which aims to facilitate each student to reach his /her potential. We aim to develop each member to develop its optimum and reach their desired goals in life. We strongly believe in nurturing each child to be a sound individual, mentally, physically and spiritually. The school offers an environment to its students which allows for their multifaceted growth and development into responsible citizens and professionals of tomorrow, where competition is favoured, achievement is applauded and individual dynamism is encouraged. The Doon Valley Public School truly epitomizes the fact that 'Success is a journey and not a destination'. 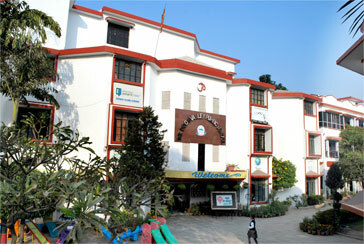 The school embodies the twin ideals of "Perception and Perfection". In school the quality of education is constantly monitored and the standards are not just reviewed and maintained but also improved with each passing day. The high quality education, well equipped infrastructure and inculcation of innovative teaching methods have accelerated the pace of growth and reputation of the school. Our students have brought laurels to school in many fields. They won the prestigious awards and accolades at district, state and national level. "Quality Education for All" is the motto that continues to inspire and motivate us and the school proudly upholds his commitment to excellence in all fields.